NSW - Project Based Learning (PBL): Can it happen in a DE environment? Yes, it can…but it does not come without some challenges. To create a truly authentic experience for our students in an online environment requires considerable commitment from interested teachers. They need to collaborate to carefully plan, scaffold and develop a process for implementation. If teachers have the ideas and drive to try PBL practices it will definitely improve the work they do in the classroom, but Thom Markham advocates that the teacher’s methodology must be infused with a deeper purpose and a vision of contribution to the future. (Markham 2017). Kelly Pfeiffer, a teacher at Dubbo School of Distance Education in NSW, was determined to find out more about how to integrate PBL in a distance education setting. She was determined to provide her students with the opportunities to experience deep inquiry, intellectual collaboration, development of personal strengths, purposeful work preparation, service-oriented learning, and a co-creative process between teacher and students (Markham, 2017). We started her PBL journey with a small year 9 satellite class. Satellite lessons are only delivered to our geographically isolated students, and this small group was chosen for their access to reliable technology and a consistent timetable for lessons. The project was 2 years in planning and developing. Throughout the establishment of PBL ideas, the team of teachers learnt much… most lessons were taught and inspired by our students’ reflections and weekly meetings with their teachers on the project (English, Science and PDHPE). Members on the team spent some time prior to starting the project undertaking professional learning sessions to try and understand the concepts driving PBL. Kelly discovered the skills and expertise of Thom Markham, CEO of PBL Global, and before long, the team were conversing with Thom via skype and completing his online PBL course to support their intentions. To start our first PBL project, the team needed to establish a high quality driving question that would have an authentic audience and contribute to their student’s sense of a vision for the future. After much discussion and deliberation with Thom, the team decided on their driving question…. 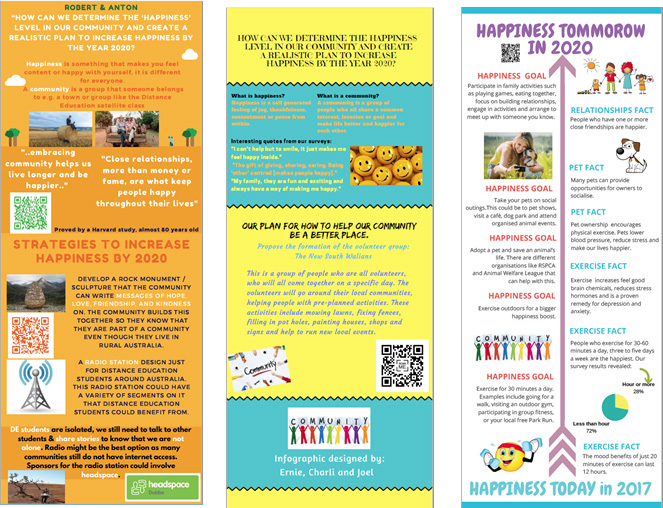 “How can I determine the ‘happiness’ level in my community and create a realistic plan to increase happiness by the year 2020?”. Our authentic audience were Headspace , a youth-friendly, free counselling service for anyone aged between 12 and 25 years, operating in Dubbo. The end product needed to be something the students could contribute to from their homes but submit as a group. It was decided that the students would design an infographic using CANVA (a free graphic-design tool website) to address the Driving Question (DQ). To explain/present their infographic the students made a recording (video and /or audio) discussing their solutions. We embedded QR codes (a type of barcode which is a machine-readable optical label that contains information about the item to which it is attached) on the students’ infographics so that readers could scan the QR code and hear (or see) the students explaining their results and ideas to solve the problem the DQ posed. What platform did we use? The students had a weekly satellite lesson per subject with their teachers. Using Google Classroom as our platform for the PBL unit allowed us to explicitly teach English, Science and PDHPE content and share multimedia clips, timeline of the project, rubrics, student’s discussion and work. We placed all the teachers and students in the one classroom so that the students knew that their teachers were collaborating on this project as well. Using this as our platform helped to create equity for all students as they all received the same information at the same time. If a teacher was absent, then one of the other teachers could address their students’ concerns or questions. How engaged were the students? There was increased level of engagement during the entire project. Students were initially a little shocked when the teachers could open their weekly work at any point (even during satellite lessons) to watch them work on their documents. It was considered a very new experience for this group of distance education students as many had relied on being sent their written work via mail or email and then returning their title pages by post for teacher feedback. The unit was launched using a video made by Headspace staff saying hi to our students, taking them on a tour of their facilities and showing them where their infographics would be displayed at the end of the project (i.e. in the front window of headspace). Student Collaboration: We learnt that we should have teamed up the students from the very beginning of the project when one of our male students reflected, “Miss, I needed to get into my team mates head a lot earlier”, meaning he needed to understand where he was coming from. We have remedied this for our Primary Stage 3 PBL unit. We now team the students from the beginning of the project using a Google doc called the, “Team Shared Google Doc”. On this doc students in their teams are allocated a font colour that they are to type in so that it is easy for the teacher and team mates to see who has contributed what. Using this document, the teachers provided a scaffold of questions to help the students to summarise their explicit teaching content at the end of each week. These questions kept the students focused on the end product by asking them what ideas they were thinking about, and the relevance of what they had learnt that week in regards to addressing the driving question. Student roles and presentation: The students were prompted to think about how they were going to present their work and who was doing what role in their group (design tech poster, what information did they need on their poster, what pictures, who created the QR code, who was going to talk about what section of their info graphic). Using technology to collaborate: In using Google Classroom stream, we found difficulty when teachers or students wanted to scroll through the stream as it jumps around and you can’t access everything. To work around this, we organised all the work into Topics on the stream. That way students could click on previous topics and find the work they were looking for, rather than trying to scroll through a stream that continually jumps around. How did we make the task authentic? We had the Headspace staff come in to work with the students half way through the project during a satellite lesson. We used this as motivation for the students, but it also deepened the learning experience and strengthened the real world connection to their learning. Headspace worked with the students on developing their survey questions on happiness for their community. The students’ final product culminated in a Residential Camp in Term 3. Students had live rehearsals of their presentations via satellite and face to face with Nic Steepe from Headspace, where they received constructive feedback in efforts to tweak their final product. Students then presented live to other students, teachers and parents at the residential camp. Students who were not able to make it to the camp were still required to present their final product and a recording of their presentation was viewed by the live audience. Definitely YES! We are already planning how we will improve the process and expand on ideas for this year. Where to from here for our school? 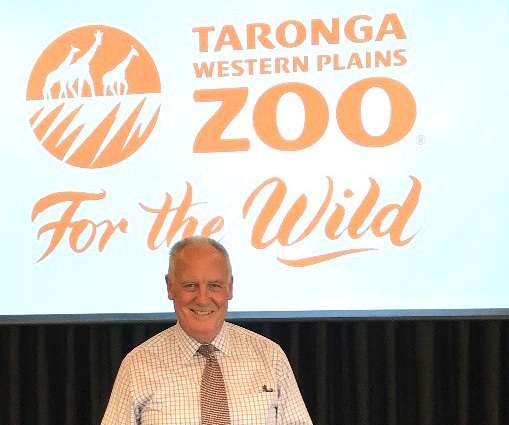 In term 4 2017, Thom Markham was invited by Dubbo School of Distance Education (DSODE) to present a two day workshop for primary and secondary teachers in the Dubbo region, and then a further one day with DSODE teachers to support a wider adoption of PBL into teaching practice. DSODE teachers as part of their 2018-20 School Plan will be developing a variety of ways to support project-based learning and to encourage collaboration of students in authentic learning experiences. Planning is well underway to support more student projects and to create learning environments that encourage further collaboration, communication, creativity and critical thinking skills to support our students into the future.